That's great for SaaS customers, but not so great for SaaS providers. It puts a special burden on providers: They need to be sure that the folks buying their solution are actually using their solution. If buyers don't become satisfied users, they'll eventually leave. The result: attrition, slower growth, higher customer acquisition costs, and other bad things. (See "SaaS Renewals and the Multiplier Effect"). In this short video, produced with the good folks at Openview Labs, I talk through 3 ways that SaaS providers can turn buyers into users. *We'll talk about long-term contracts some other time. This work by Peter Cohen, SaaS Marketing Strategy Advisors is licensed under a Creative Commons Attribution 3.0 Unported License. Images obtained via iCLIPART.com. I recently switched to a new health club. It's better maintained, friendlier, and less crowded than my old club. I also like that there's no up-front membership fee, just a monthly subscription. But making a change from my well-worn routine, set in place over 12 years, could have been a difficult jump. New location, new equipment, new people. But all worked out well. Here's why. On my first visit to the new club, the manager introduced himself, gave me a card with his contact information on it, and introduced me to an assistant manager who was at the front desk. Then the manager showed me through the facility. He explained how to sign up for spin classes, where to find the jump ropes, and how to adjust the steam room controls. Finally, he introduced me to a trainer to set me up with a workout regimen. We didn't go through every elliptical trainer, Bosu ball, and Cybex machine in the club, but the trainer put in place a basic program for me. Health clubs, like software-as-a-service (SaaS) businesses, depend on renewals. And the customer's first experience with the service - the on-boarding process - is critical. Get off to a good start and it's much easier to retain customers. How did my new health club get this right and how can SaaS companies do the same? On my first visit as a paying customer, I was introduced to the club manager, his assistant, and I knew how to reach them. I now had a direct connection to someone I could talk to with suggestions, complaints, or compliments. It also works for SaaS companies. Let the customer know who they should talk to with any issues related to the service. It might be one person or it might be two or three (for example. one for support, one for billing, etc.) but try to make a direct connection. A simple letter - "Thank you for becoming a customer. If you need anything, ask me." - can suffice. The manager showed me around the club and offered specific instructions on how to take care of basic tasks myself. Of course, I'd had a tour before I signed up, but he walked me through again, this time providing more detail on where things are and how things work. SaaS companies should do the same. Help new customers to find their way around the service. Walk them through the basics, so the next time they'll have the knowledge to manage it themselves. Better yet, they'll have the confidence to explore further and find new features on their own. A written guide on how to take the first steps, with lots of screen shots, can be helpful. On my first visit to the health club as a paying customer, a personal trainer got me started on a basic routine. She showed me how to use a few basic machines, adjusted the seats properly, and set a "don't hurt yourself" weight. She even wrote it down for me on "Personalized Workout" tracking sheet. This wasn't a $60 per hour personal training session... it was just part of the welcome process. Following that session, though, I had an established commitment to a new routine. Likewise, SaaS companies should concentrate on getting their new customers to start to actually use the service. Make sure they know how to login. Help them enter data and walk them through a few basic tasks. Get them using the product and make it part of their routine. By the way, on my 3-times per week visits to the health club, I've been making good use of the steam room. The spin class... not so much. The good news about the SaaS subscription model: long-term paying customers. The bad news about the SaaS subscription model: long-term paying customers. With the software-as-a-service (SaaS) business model, vendors can build a sustainable source of long-term, predictable revenue. As long as the subscription fees cover customer acquisition expenses and other costs, the model should support a profitable, growing business. Long-term, paying customers require long-term care and feeding. In exchange for collecting on-going subscription fees, the SaaS vendor takes on substantial on-going obligations. Some of those depend on product development and operations. They need to keep the SaaS solution up and running, protect the customer's data, and add new features over time. But marketing plays a role too. Those long term customers also expect on-going communications from the SaaS vendor. They want to know how best to use the system, what enhancements are being developed, and what other customers are doing. And they don't want just one-way communications. Customers want a way to have input into what new features are built, and they want a way to share information with other customers. This is where marketing comes in. (I warned you that we weren't off the hook.) Marketers need to take a role in building and maintaining communication channels with existing customers. Talk to existing customers? For lots of marketers, this could be new territory. When I was responsible for marketing traditional on-premise applications, I usually only thought about existing customers on two occasions: once at the annual user group meeting, and second when I needed a customer reference. That's it. Nothing personal; it just wasn't my job. My main responsibility in marketing then was to find new customers. People who had already signed up and paid weren't my concern. In the SaaS subscription model, it's all different. Retention and renewals are an essential part of marketing's job. Marketers need to focus on existing customers as much as on prospective customers. In fact, in the SaaS world, existing customers are prospective customers. I was surprised, though, to hear from these IT professionals about another concern: usability. After all, these folks have somehow managed to endure frighteningly off-putting user interfaces for quite awhile. SAP ERP screens are not for the faint of heart. The IT folk's attention to usability is driven not so much from a new-found sensitivity to graphics and color. Instead, it derives from a greater appreciation for the needs of their users. They don't want to deploy applications that confuse, frustrate, and torture users. The IT professionals on the panel have found that the SaaS solutions they've acquired tend to be more widely deployed within their organizations. They're not confined to highly-trained, dedicated users with a high threshold for pain. Instead these solutions for expense reporting, recruiting, asset tracking, or sales compensation management, for example, are used broadly, not by experts and not on a daily basis. What that means is that applications with inscrutable interfaces that frustrate non-experts cause problems for IT professionals. And even though the application wasn't built by the in-house IT group, it doesn't run in their data center, and they didn't have anything to do with the interface design, IT always gets the blame. It goes with the territory. As a CIO colleague explained to me once,"People never call me to say 'Thanks, Jamie, the email is running flawlessly today.' I only hear from them when something's broken. This is the worst job in the company." Not only do the IT folks get an ear-load of grief from users who complain that "IT is deliberately wasting our time with this awful system," but they also bear the burden of supporting these end-users. Through a help desk or training, they spend money on to help users navigate through the application. A poorly designed user experience will make it more difficult for you to market and sell your solution. Propping it up with specialized training for dedicated users isn't a workable solution for the broadly-deployed applications. The IT professionals won't let you get away with it. A poor user interface will make it harder to renew customers. Even if you succeeded in getting an initial deployment into the organization, it will be difficult to retain those frustrated users, never mind adding new ones, if the product is painful to use. A badly designed application is expensive to support. If it's the internal IT professionals who take on the support role, they'll be unhappy. You're costing them money and grief. If it's you, the vendor, who provides the support, it will cost you money... though the internal IT people will still get the grief. Marketing professionals, fixated as we are on messages, lead generation and sales enablement tools, sometimes pay less attention to product features and functions than we ought to. Our success with SaaS solutions, however, will increasingly depend on an easy-to-navigate and delightful-to-work-with user experience. If IT professionals are paying attention to what a product looks like, marketing should too. It's been my experience that I learn more from failure than success. And there are some who would quip that I've certainly had ample opportunities to learn. To gain from the experience of failure, though, requires that you recognize it when you see it. 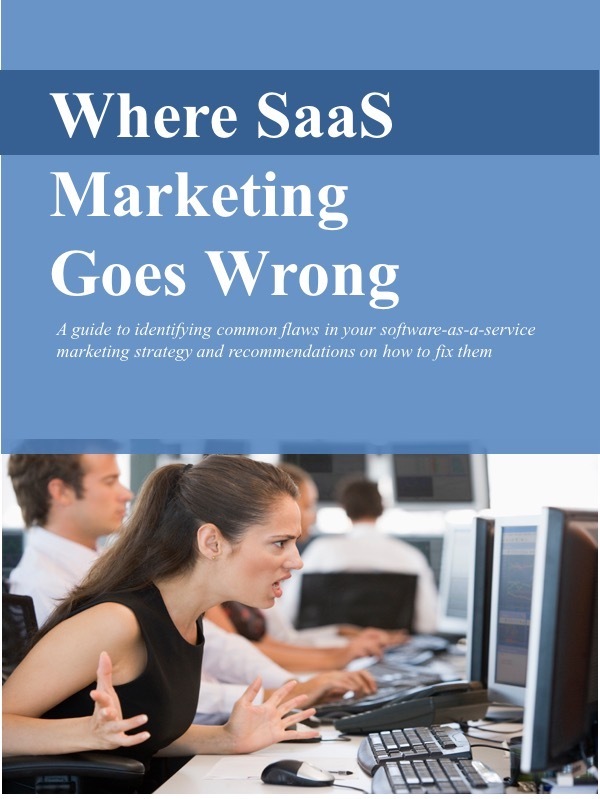 To help software-as-a-service (SaaS) solution providers recognize their failures, I'll point out a few telltale signs that will let them know that something's gone wrong. When your customer acquisition costs can't be covered by the projected lifetime subscription revenues derived from customers, you have a problem. A faulty sales and marketing machine gobbles up one dollar in expenses and pays out less than one dollar in revenues. To borrow from another business axiom, if a dollar in yields less than a dollar out, you won't make it up in volume. There could be several solutions to the problem: establishing a more efficient sales and marketing process, securing more renewals, raising the subscription fee, or articulating a more compelling value proposition, among others. But if you find that you are spending more than you're earning, first acknowledge that you have a problem. Note that the calculation for customer acquisition costs measures annual sales and marketing expenses relative to subscription revenues earned over the lifetime of customer. SaaS companies should, in fact, expect to pay a high percentage of annual revenues on sales and marketing - often in excess of 40%. But the goal is to earn that back, and more, over the entire length of the customer's subscription. A high-functioning customer acquisition machine can gobble up one dollar of expense to win a customer, but should pay out three, four, five dollars or more over time. If the cost to implement your solution is chewing up a large chunk of the subscription revenue, you may have product problem. High implementation costs and long deployment times are often a symptom of a SaaS solution that requires extensive customization. Not only is customization an immediate problem, but it usually grows worse over time. Every upgrade to the solution may require additional implementation expenses. Even if the customer has paid for the initial implementation work separately, the vendor incurs new expenses with every new product release. There's a cost to violating the SaaS multi-tenant model. The solution is configuration instead of customization. Better yet, configuration managed by the customer. Allow them to tailor the solution to suit their particular needs, but without altering the core of the solution. If you find that sales cycles are extending too long, there's a problem. The SaaS model usually functions best at faster speed. You spend money now to make money later. Anything that delays the "make money later" part of the equation is a bad thing. The sales cycle might be stalled by IT professionals with legitimate questions about security, performance and integration. Or perhaps, legal and procurement professionals are struggling to understand the unique SaaS terms and conditions. Multiple drafts of red-lined contract drafts pinging between vendor and customer are a sure sign that something's gone wrong. IT, procurement and others involved in the purchase decision should be educated and won over, and earlier in the process is better than later. If your marketing group is struggling to keep marketing and sales support material up to speed, you may have a broken product introduction process. You'll know it, for example, if your web site and product literature are out-of-date, or press announcements lag product enhancements by weeks or months. The cause may be a product introduction process that's built for on-premise applications and 18-month enhancement cycles. It's out of sync with a SaaS development schedule that rolls out enhancements every quarter. Your marketing team is caught on the "wheel of death" and can't run fast enough. This isn't a comprehensive list, but you should be on the lookout for each of them. They're all symptoms of your SaaS model gone wrong. In case you've forgotten the concept of the multiplier effect from Economics 101, it's commonly used to project the impact of a change in government spending or money supply on the growth of GDP. If, for example, we know that the government spending multiplier is 5, and the government increases spending by $10 billion, we'd project that GDP would grow by $50 billion. In a similar fashion, renewals have a multiplier impact on SaaS companies' revenues. The higher the renewal multiplier - that is the more times a company can renew a customer and extend its revenue-generating life - the greater the revenue accruing to the company. To be more precise, what we're actually referring to here is "lifetime customer revenue." $17,780 average annual revenue per customer * 3 year customer lifetime = $53,340 lifetime customer revenue. $17,780 average annual revenue per customer * 5 year customer lifetime = $88,900 lifetime customer revenue. To illustrate the dramatic impact of longer customer life on lifetime revenue, I've calculated the lifetime customer revenue at several publicly-held SaaS companies, using 5-year, 3-year and 1-year renewal multipliers. As expected, a higher renewal multiplier yields substantially higher revenue. This calculation becomes truly useful when comparing the lifetime customer revenue to the cost of acquiring a customer, i.e. sales & marketing expenses. According to this illustration, when salesforce.com can extend the average customer lifetime to 5 years, the company generates $2.40 in lifetime customer revenue for every $1 spent on customer acquisition. At a 3-year lifetime, $1.44 of lifetime revenue is generated. And at a 1-year customer lifetime, only 48 cents of revenue is generated for every $1 spent on sales & marketing. As you can surmise, spending more than $1 to acquire a customer that yields less than $1 in lifetime revenue is not a sustainable business model. Extending the life of the customer's subscription is critical to success. It's bad business to lose customers you've already paid for. Early in my career, I taught bank credit analysts-in-training how to read financial statements. During my course, they heard from me one constant refrain: "Read the notes, read the notes, read the notes." The notes to a company's financial statements often reveal critical insights behind the numbers. The advice on how to read financial statements certainly applies to software-as-a-service (SaaS) companies, and especially to their reported customer renewal rates. SaaS companies may claim that they have renewal rates of 90% or 95%, but it's critical to look behind these numbers and understand how they're calculated. Is a 90% renewal rate a good thing? First, it's important to know what the company is really counting when it refers to "renewals." Are they referring to the number of customers, or to revenues? Are they counting only the customers whose contracts are up for renewal, or all customers? Then, carefully examine how the renewal rate or attrition rate is calculated. Other companies compare the number of customers at the beginning of the period plus the customers gained over that period to the number of customers lost during the period. By this alternative method of calculation, if they start the year with 100 customers, lose 15 of them over the year, but acquire 50 new customers over the year, they'd show 10 % attrition or a 90% renewal rate: 15/(100+50). Voila! An 85% renewal rate becomes 90%. Finally, look carefully at the length of the subscription term. If the subscription term is one year, a 90% renewal rate means that the company loses 10% of its customers each year. If the subscription term is one month, a 90% renewal rate means that the company loses 10% of its customers each month. At that rate, it will lose its entire customer base in less than one year. So to answer the question, "Is a 90% renewal rate a good thing," by reading the notes you may have equipped yourself to provide a definitive answer: Maybe. Thanks to Tod Loofbourrow for his insights on this topic. As for the headline, I assure you that I'm not channeling Dr. Phil. I'm actually thinking of an ad run by McGraw-Hill many years ago to explain the value of advertising. As you can see, a very skeptical prospect is saying, "I don't know who you are, I don't know your company... Now what was it you wanted to sell me?" I should maintain a long-term relationship with you. To satisfy this skeptical prospect, you need to establish a high level of trust. By its nature, SaaS is not a one-time transaction; it's a long-term relationship. So how do we marketing people build that relationship and establish trust? Win "trust by association." That is, show that other companies, particularly those with a high-profile and good reputation in their industry, are using your solution with success. Case studies and endorsements are obvious vehicles. Show the roadmap. Let prospects know where you're going, and importantly, show that you have a track record of delivering as promised. Build an engaging brand, something that prospective customers are attracted to and want to be associated with. Of course, lead generation and lead cultivation are important, but don't neglect the need to build a strong, positive perception in the market. Build a community. Establish a venue where customers can share their experience with others. This venue can be a restricted-access web site or more traditional customer conferences. Keep customers informed. Let them know about new enhancements and encourage them to take advantage of them. Share your success with them. Let customers know of your progress and solicit their input. Customer advisory boards, for example, can be effective. Give customers a sense of investment in your success. Remember that with a SaaS solution you're not simply marketing and selling a technology fix for a particular problem. You are actually earning the right to be a critical part of the customer's business. You're building a long-term relationship. Once upon a time in the technology marketing community, a story circulated about a rapidly-growing software company with a reputation for especially aggressive sales tactics. It was said that the only way for a besieged prospect to shake off their dogged sales execs was to break down and actually buy their product. Once you became a paying customer, they instantly disappeared. Though the story exaggerates perhaps, the point still pertains. In the on-premise software model, you can win the deal, secure the up-front license fee, and then head on to the next victim... I mean prospect. In the software-as-a-service (SaaS) model, however, this approach won't work. For one, you need happy customers to serve as positive references. Sure, positive references are always important for business - SaaS or otherwise. But they're especially important for SaaS companies, where you need to be particularly frugal with customer acquisition expenses. And the fact is, positive "word-of-mouth" promotion can be very cost-effective. A second reason to keep existing customers happy is renewals. Unlike the on-premise license model, SaaS providers need customers to renew when their subscription expires. High renewals and low "customer churn" are critical to recovering the initial customer acquisition and provisioning costs. Many of the successful SaaS companies are achieving renewal rates of better than 90%. So now I can imagine the already over-burdened marketing executive muttering, "Just what I need - another target audience. Like it's not tough enough to reach all the influencers at my prospective customers - the functional buyer (e.g. HR, sales, accounting, etc. ), the CIO, the CFO, procurement - now I need to reach them within my existing customers too." For those marketing folks who haven't become completely discouraged and stopped reading yet, I'll offer a couple ideas on how to manage this challenge. For one, include your existing customers right along with your prospects in most of your marketing efforts: invite them to webinars, send them case studies, meet with them at tradeshows and conferences, and send them news on product enhancements. You've promised them an on-going stream of enhancements over the life of their subscription. Make sure they know about the enhancements and encourage them to use them. A second practice that I've seen succeed is an on-line "community" web site where customers can ask questions and provide answers on best practices. Your own experts within the company can jump in, but often customers are in a better position to help other customers. Besides the impact on support costs, an engaged group of customers can be your most effective advocates, so give them a forum. The challenge, of course, is to run these programs to engage existing customers within a constrained marketing budget. (I didn't promise this would be easy.) But ignoring existing customers - the "take the money and run" strategy - will ultimately lead to lower renewals and higher new customer acquisition costs, which for SaaS companies is a shortcut to failure.